I officially fell in love with the PETITE's world, so I'm showing them again today, and sharing some useful info and tips if you ever wanted to join this magic world. 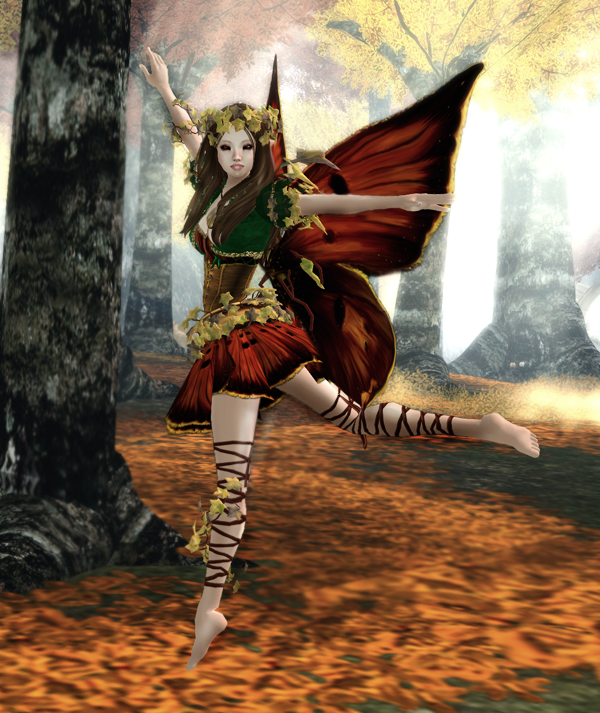 Angelwing adapted some of her beautiful fairy outfits to the PETITE avatar by Yabusaka. Here I'm showing you my favourite, Fall Fairy, that you can purchase only at the PETITE Headquarter at Yabusaka. After checking the pics, you may want to have a look to a list of PETITES Resources, a collection of stores where you can find items that can be resized to fit the tiny avatars, put together by the lovely Dojiba Sabra. Contact her if you're interested in the PETITES world and to get the new lists as soon as she finds out new stores! Last but not least, a pic to show you the size of a PETITE avatar. Avatar & Body: Yabusaka & Fallen Gods Inc. Please be sure to join the Petites group for all the latest news! Group joiners are at Fallen Gods and Yabusaka (look for the glowing orb in the Petites area, or do a group search for petites. Are your feet or hands a different color from the rest of your body? First make sure they are from the same tone as your skin. Put on the skin tinting hud that came with your Petite and choose the white box at the top, just under the word Presets and that should make them match. If you can't see your body after putting on the demo or avatar, make sure you have Hardware Skinning turned on in your Graphics tab. If you still can't see it, make sure you are wearing the item called Body. You will have choices such as natural, cherry, marks, corruption. We're finding that some ground sits will put you under the ground. Try adjusting your offset to raise your avatar. The Petites mesh avatar and demos are available at Fallen Gods, also mesh hair from Wasabi Pills, a mesh fairy dress by G Field, floral vine outfits by Frippery and more. Seven's Selections has a vast assortment of wings which will resize down to fit a Petite. A hud controls speed, size, etc. They are also mod, so you can tint the white ones or drop a particle script into a pair. Material Squirrel wings will resize with the hud and are Xcite compatible. EDIT: I got this kind message from Kala Bijoux, owner of Material Squirrel: "Thank you for mentioning Material Squirrel Wings as a resource. All of our wings have scripted resize via the HUD - but if they don't go small enough, IM Kala Bijoux and she can get you a pair that does. All Material Squirrel wings are mod as well - the scripts inside are not mod so they show in inventory as no mod but once rezzed or worn, the object will be mod." Wasabi Pills has hair with resize scripts that will shrink down to fit. Be sure to try the demo first, as not all of them shrink enough. Jolie Femme has hair with a resizer script. Look for the "Touch to Fit" logo on the vendors. Battle Angel has some resize-scripted hair that will fit. I haven't tried the ones that aren't scripted, so I don't know if they will shrink down enough in edit mode. CaTwA hair hair will resize with the built in scripts. fri.day hair should shrink down just with editing tools. Truth hair will shrink down if you add a resize script to it. Even the already scripted texture-change hair will work, as long as it's mod. You may fight with the popups a bit to get the menu you want, but it can be done. The Looking Glass has clothing for Petites (and a very nice fae area close by). Isanna Delvalle has opened a clothing store in the marketplace. Sinful Needs has demon/demoness outfits, horns and tails that will resize with the A4 Hud. KaiAna has a variety of clothing, from silks to skating outfits (with little skates! ), medieval dresses, gypsy outfits, jeans and tops and more. Take the teleporter to the Petite Hideaway. Lillia Coveria has some Petite items in her Marketplace store and her inworld store, with more to come soon. Les Petites Nymphes has two fairy outfits for sale, which includes bracelets, ring, head wreath, wings, etc. More in the works! Lemon Tea, animated tails to fit Petites. Ibanez prim eyes will resize nicely, no script needed. The size I made mine is X 0.0151, Y 0.0193, Z 0.0168. That's a good place to start and then you can tweak the size however you wish. Redgrave lashes will fit if you add a resize script, shrink down and then fit as you normally do. Creative Insanity has Fairy, Fae, Pixie, Forest Nymph, demon/demoness and mermaid AOs. Kami-Hitoe Fairy and mermaid AOs. ZMD has a cute Petite-sized lilypad with sits for 3 merfolk. Look for Zohee's Mermaid Designs in the NE corner of the mall. je suis... jewelry can be resized to fit your Petite. Rainey Fae has Petite-sized earrings and circlets- no resizing necessary! Find them on the second floor. In her notecard, Dojiba also includes a tiny camera hud to give you a proper view according to your size, and a resize script. Another resize script that works even better is here on the marketplace, free. If you have any addition to this list, feel free to contact Dojiba inworld! Thank you for mentioning Material Squirrel Wings as a resource. All of our wings have scripted resize via the HUD - but if they don't go small enough, IM Kala Bijoux and she can get you a pair that does. All Material Squirrel wings are mod as well - the scripts inside are not mod so they show in inventory as no mod but once rezzed or worn, the object will be mod. Thank you Kala for letting me know! I'll add your kind message in the post so that everybody will know!